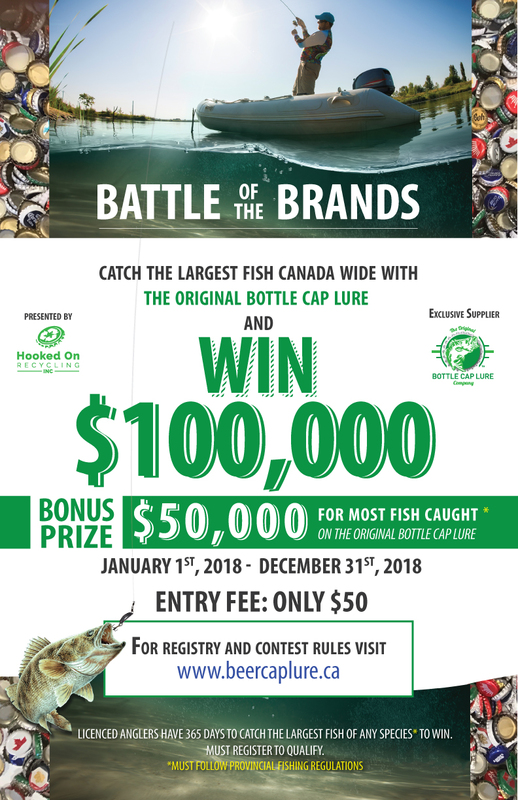 In partnership with Hooked on Recycling, The Original Bottle Cap Lure Company is the exclusive supplier for the Battle of the Brands Canada-wide fishing contest running from January 1st, 2018 to December 31st, 2018. The angler who catches the largest fish using The Original Bottle Cap Lure™ will win $100,000 and the angler who catches the most fish will receive $50,000. While many popular species are listed as the target species, all species are eligible and can be logged by selecting the "Other" species option when logging online or in the mobile app. Hooked on Recycling is a non-profit organization that strives to raise environmental awareness and to reduce the number of bottle caps disposed in landfills. The Original Bottle Cap Lure Company helps fund Hooked on Recycling by purchasing recycled caps obtained from their Collection and Repurpose Program and crafts them into functional fishing lures. The purpose of this contest is to aid in the effort to raise environmental awareness while also promoting sustainable and ecologically friendly fishing practices. (i) Contestants must register to qualify. Registration is non-refundable. (ii) All eligible entrants must have purchased* or obtained** The Original Bottle Cap LureTM and used it to catch a fish submitted to the Battle of the Brands committee. The lure must be in its original and unaltered state. *Proof of purchase is required; date of purchase must be prior to catch and submission. **Pertaining to The Original Bottle Cap LureTM custom printed lures. (iii) Contestants must obtain registration prior to participation in the contest for any catches to be considered valid. 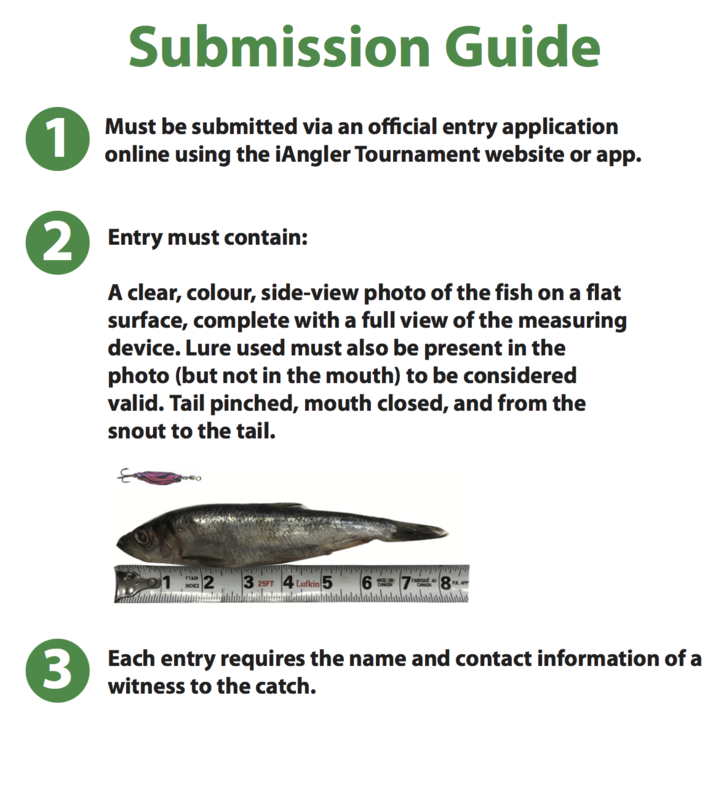 (iv) Participation is open to any person who holds a valid Angler’s License, or if fish are caught during free fishing weekends as pertaining to contestant’s region of provincial regulations. (v) Each entry must be submitted via an official entry application online using the iAngler Tournament website or app. (vi) Entrants and entries are not automatically accepted, but will be reviewed for eligibility at the discretion of the Battle of the Brands committee. (vii) Each entry must be accompanied with a clear, colour, side-view photograph of the fish, which must include the lure used. The lure is used as the contest identifier, and so the full lure must be clearly visible (not in the mouth). The photograph of the fish must be on a flat surface and contain a complete view of a measuring device of standard size showing the total length in a horizontal straight line from the tip of the snout to the tip of the tail. 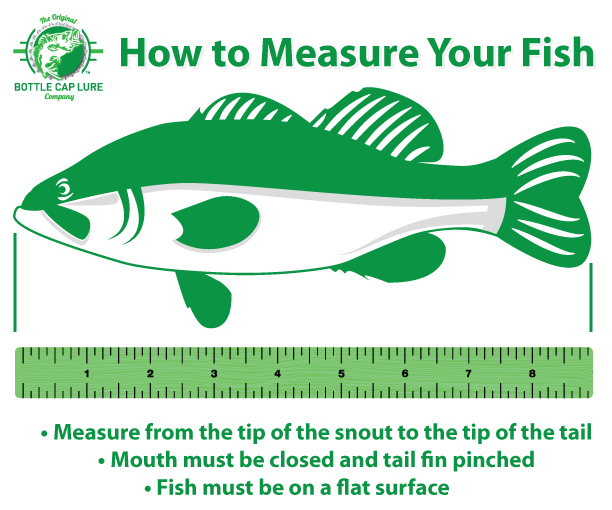 The mouth must be closed, and the tail must be pinched for the entry to be considered valid (see “How to Measure a Fish” diagram and the “Submission Guide” for reference). Any entries with poor quality photographs or incomplete or incorrect information may be disqualified. (viii) Each entry requires the name and contact information of a witness to the catch. (ix) This contest is exclusively a catch-and-release event. All fish must be released after photo is taken. Fish that do not survive when released or exhibit any indication of improper handling will not be considered eligible. (x) Each fish caught is only valid for a single entry. Any attempt at multiple entries of the same catch will be disqualified. (xi) Contestants must familiarize themselves with and abide by provincial angling regulations as per the region; fish must be caught legally within public Canadian waters. Any contestants who display unlawful activity, deception, or dishonesty will be disqualified based upon the discretion of the Battle of the Brands committee. (xii) All species are eligible with the exception of invasive, protected, or endangered species. (xiii) Upon review of the winner, the lure(s) used to catch and submit entries may be required for inspection by the Battle of the Brands committee. The winning contestant(s) may be required to participate in, and pass in a conclusive manner, a polygraph examination at the expense deducted from the prize money. If the polygraph examination is not passed, the participant will be liable for the expenses. (xiv) In the event of a tie, the prize money will be distributed evenly between winners. (xv) The winner(s) will be reviewed by the Battle of the Brands committee and their decision will be final. By registering for the contest, all entrants acknowledge, understand, and therefore agree to abide by these rules. Battle of the Brands reserves the right to publish any names and photographs, as submission and registration shall be considered an agreement to surrender all information to Hooked on Recycling, and by association The Original Bottle Cap Lure Company, as their exclusive property. Battle of the Brands will not share personal information with any third party. Battle of the Brands and any of its associations are not liable for any personal injury or death, property loss or damage sustained while participating in the contest. Subject to cancellation due to lack of interest.